There was a lot of finger-wagging and eye-rolling at Leaders’ Questions today. WATER CHARGES WERE the topic of discussion yet again during Leaders’ Questions, with Barry Cowen criticising the fact that water meters may only last 15 years. Fianna Fáil’s environment spokesperson asked Tánaiste Joan Burton if she believed that spending a large amount of money on meters was appropriate at a time of chronic hospital overcrowding and “almost non-existent” community care for elderly people. “Meanwhile, back at the ranch you and Irish Water are spending €500 million on 1.2 million meters that may only have a lifespan of ten years,” Cowen continued. Burton said the meters will last a minimum of 15 years, saying they have worked for “significantly longer than that” in other countries. The Tánaiste said it was a pity that Cowen didn’t “get a chance over Christmas to read up on it”. “Fianna Fáil is looking to identify anything and everything it can to denigrate the people who work in water services,” Burton stated, adding that the party seemed to have lost its “taste for investment” when it “lost the banks”. She said Ireland’s water infrastructure desperately needed funding as raw sewage is flowing into several rivers. Cowen was not impressed, labelling Burton’s response “lazy and predictable”. He said the Tánasite had “sat idly by not knowing what was going on around [her]” when water meters were first discussed at Cabinet. Burton said it was “ironic” that Cowen was lecturing her while Patrick Honohan, the governor of the Central Bank, was “retelling the very sad story of how Fianna Fáil chose to expend €34 billion on two failed entities”. Also during Leaders’ Questions, Burton assured Mary Lou McDonald that the Government would fulfil its promise of providing 5,384 social housing units this year. 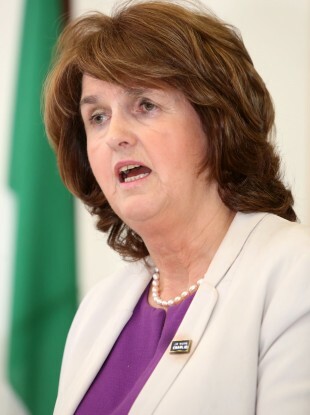 “Take it from me deputy, we will be delivering on this commitment,” The Tánaiste said. Independent TD Maureen O’Sullivan brought up the issue of active drug users sharing homeless accommodation with recovering addicts. Burton said therapy and rehabilitation was being provided for service users where necessary. During the ensuing debate, Sinn Féin’s Jonathan O’Brien said that his own brother was homeless due to a heroin addiction. When Labour’s Eric Byrne asked why his family didn’t take him home, O’Brien told him “shut your mouth”. Email “Joan Burton thinks concerns about water meters are ‘a total ball of smoke’”. Feedback on “Joan Burton thinks concerns about water meters are ‘a total ball of smoke’”.